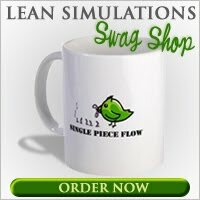 Lean Simulations: Equally Massive List of Free Lean Videos! If a picture is worth a thousand words, then a video is worth a million. Entertain your team with a video and give your voice a break from lecturing. These Lean videos are perfect to augment your training sessions. I'm constantly updating this page with more videos, so check back often and let me know of any bad links. A stop motion video, with Lego minifigures showing all the basic principles of lean in their factory. Introduces the basic principles of kanban and buffers by producing toy sailboats. Silly video illustrating the pitfalls of relying on a forecast. Real world example of single piece flow and leveled production in a manufacturing environment. Video describing the "Standard" part of 5S, i.e. the fourth S.
Video course from MIT showing a classroom session of a Lean Lego simulation. Formula 1 pit stop shows the benefits of 5S, teamwork and standards. Short video of a quick die change using Lego blocks. This video shows the benefits of work in process and auto-eject in a U-shaped work cell. Video explains takt time and how it applies to your morning coffee. Standard work applied to making peanut butter and banana toast in your own kitchen. Short animated 5S video with a catchy song that reviews all 5 S's in an office setting. Kanban explained in just over a minute. Perfect for Standard Work training. Video describes a two bin inventory replenishment system using a flow rack. A review of a successful 5S implementation in a maintenance shop. A 15 minute intro to lean philosophy and common lean tools. A look at 737s being built on a moving assembly line. A five part video series explaining the difference between traditional and lean accounting methods. An actual kaizen event on improving an order entry process. Tour shows how niche backpack manufacturer uses a lean kanban system. Short video outlining the basics of a value stream map. Clever animation showing how the value stream shrinks when waste is removed. A grade 7 and 8 class showcase their lean projects. A short video showing how single piece flow shortens the lead time of a process. Kyocera applies 5S to their office. The new F-35 strike fighter gets assembled on a moving assembly line. How to run a successful kaizen workshop. A lean simulation showing bucket brigade production. A humourous look at a unique quotation process. How McDonald's "Made for You" kitchen system can deliver a sandwich in under 90 seconds. A sheet metal process with linked work stations. An excellent description of kanban in Spanish. A three minute video with some key points about lean manufacturing, including a value added vs non value added description. Another short video demonstrating 4 lean principles. The difference between batch and lean, with hand sketches! Bruce Hamilton gets egg on his face. Kanban system at a medical device manufacturer. 2 bin kanban system is used to manage assembly components. Comparing a F1 pit stop from 1950 to 2013. Feel free to post your own links on my introduce yourself page! The Stronach Group, which owns Gulfstream Park, bought the three slots that weren’t sold by the deadline last month and is making them available in revenue-sharing partnerships.Breeders Cup 2018 Live Stream One of those spots was filled earlier this week by the owners of Giant Expectations, inspired by a year-end upset win in the Grade 2 San Antonio Stakes at Santa Anita on Dec. 26. Ritvo said discussions are ongoing with four or five groups and expects to finalize deals for the final two berths within the next few days. Toast of New York and Seeking the Soul are the others set so far. Frank Stronach, the 85-year-old billionaire who owns Gulfstream and conceived the Pegasus World Cup, hasn’t announced the horse that will run as his Adena Springs entry. Last year Adena Springs-bred Shaman Ghost finished second. Clearly, The Stronach Group has a lot at stake in this event having bankrolled four of the $1 million entries to ensure a field of 12 and also adding $4 million to boost the purse from the world-record $12 million of last year. The collusion said the activity had the full help of the four business bodies containing coaches, racers, reproducers and proprietors. "It comes after a due date on Thursday when the state government neglected to convey the asked for promise to return 100 percent of the hustling part of the Point of Consumption assessment to dashing," it said. "Notwithstanding claims that 100 percent of this new expense will be come back to dashing, the unmistakable actuality is none of this will be come back to pure blood hustling this year. "Prizemoney is our wages. Ten years prior our kin were getting 75 percent of what NSW dashing conveyed in prizemoney and now Queensland sits at 45 percent and as the various states grasp this new wagering duty this hole will just augment further." The announcement says huge budgetary venture from the new "wagering charge" given by alternate states to their dashing enterprises, unmistakable difference a glaring difference to what is appeared in Queensland. "While this mechanical activity Melbourne Cup 2018 Live is absolutely not the business members favored reaction, the administration's absence of comprehension of the significance of the present circumstance in Queensland, abandons us with no option," it said.